The Vietnamese hill tribes made him a demi-god. The CIA wanted to kill him. This is the remarkable true story of Australian war hero Barry Petersen. Frank Walker's critically acclaimed bestseller is now part of the HACHETTE MILITARY COLLECTION. Start reading The Tiger Man of Vietnam (Hachette Military Collection) on your Kindle in under a minute. I have read many books re the Vietnam War, but Captain Barry Petersen carried out his duties to the highest level,inspite of the shady politics that were exercised during the war in Vietnam. He carried out his duties and did his best for the Montagnard Hill Tribe people, who had had a rough time from the North and South of Vietnam. Barry and other Australian Army Advisers were in the rough end of Vietnam,well before Australian Troops were officialy committed to this hopeless and unpopular campaign. The book brings to light many of the dirty tricks that were used in Vietnam.Barry Petersen trained his Montgnard Hills people, to hit the Viet Cong, do the required damage and get out.Captain Petersen did not always get the support from Senior members in the Australian Defence Forces. 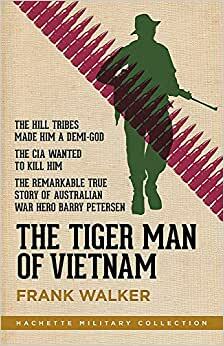 `The Tiger Man of Vietnam' is a soldiers story of courage and service. Of bravery that goes above and beyond. But it reveals more than that when the spotlight turns to the political players who move the pieces on the chess board of war. Politics casts a dark shadow, and perhaps no war in our recent history has been more murky than the Vietnam war. Sadly, (particularly in that war) the soldier doing his duty became the focus of enmity when more appropriately, the political intrigue that created the war zone should have been the target. Special Ops, CIA, money, and politics - it's all there. A valuable and revealing insight into the Vietnam conflict. Great story great patriot pity politicians never learn from history - RIP Barry you will be missed by your many friends. Good book but I was expecting a little more. Definitely a very good soldier. An excellent book about a courageous man!